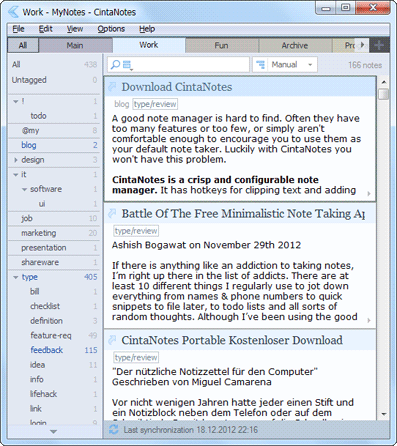 A free, lightweight and user-friendly personal notes manager. Its features include: - Easy text clipping. Just select any text in any application and press the hotkey! If it works with clipboard, it works with CintaNotes. - Exteremely lean and fast - Fast as-you-type searching - Saves your screen space: No sticky notes clutter - Portable: Run it from your flash drive. CintaNotes is designed to be your indispensable assistant in the daily task of collecting numerous pieces of information, whatever they may be: your own thoughts and ideas, book and article excerpts, job postings, famous people quotes, research data, curious facts, Wikipedia definitions, blog posts, important news, you name it. It lets you quickly jot down and tag any piece of useful information that you come across while reading documents or surfing the web ??? just select the text and press Ctrl+F12. With CintaNotes, this is really all it takes to make a note! CintaNotes does not clutter your workspace with "sticky notes", all notes are neatly organized in an easily navigable list. Unlike browser-based tools like Google Notebook or Firefox plug-ins, CintaNotes does not require a web browser to work. It works in Microsoft Word, Outlook, Adobe Acrobat; in fact, the text capturing "magic" works in all applications that can copy text to clipboard! Retreiving information is also trivial: just open CintaNotes and start typing, and only notes which contain the text you type will remain in the list. More sophisticated search criteria are supported, like searching by title or by URL the note was taken from. CintaNotes is a totally self-contained application, meaning that you can put it on a flash drive and run it directly from there. In this way, your notes will always be with you. Tesuji CRM is a crm software easy, economic and effective to organize your team work around the relationships which you have with your prospective customers, customers and partners. Management of contacts, sales forces and projects. Pocket PRP is a 3 Way solution provider. It works as a Personal Assistant, brings you resourceful information, and helps you organize your plans.It comes with comprehensive modules in-built to make your phones more useful with must-haves. Desktop-Reminder is a FREEWARE task planner with calendar and reminder. Always during start of Windows it lists all tasks, which are urgent for that day. It can notify about tasks even months earlier. Calme is made for creating and printing beautifully looking monthly planners, yearly planners and picture calendars in minutes. Calme is available in english and german. It is free for private and non-commercial use. Comprehensive PIM suite with many advanced functions. Programs to help you manage your life to stay on top of things. These much required &amp; freely available programs are made with advanced functions in a simple and powerful automated interface. Speicherschonende Terminverwaltung mit FTP Upload und Download basierend auf NET. Akustische und Visuelle Erinnerungen und die UploadmÃ¶glichkeit als Webseite zeichnen dieses Programm aus. Synchronisation zwischen mehreren Rechnern per FTP. This site does not contain serial number, crack, keygen CintaNotes Free Personal Notes Manager serial number : serial number is the simplest type of crack. A serial number(cdkey,product key,etc) is register the program as you may already know. a crack or keygen may contain harmful software. If you cannot find the exact version you want, just give it a try. for more information read .nfo/.txt/.diz file include in zipped file.